The rich had vast land holdings and the tenants paid taxes and rents. The movement grew to 10,000 men and was finally put down by a cavalry unit of 3,000 who came up from New York City. In 1839, around the time of the Dorr Rebellion in Rhode Island, when a deputy arrived in the farming area of in the Hudson Valley near Albany, New York, with writs demanding the rent, farmers suddenly appeared, assembled by the blowing of tin horns. They seized his writs and burned them. That December, a sheriff and a mounted posse of 500 rode into the farm country, hut found themselves in the midst of shrieking tin horns, 1,800 farmers blocking their path, 600 more blocking their rear, all mounted, armed with pitchforks and clubs. The sheriff and his posse turned hack, the rear guard parting to let them through. Certain men in the farm country became leaders and organisers: Smith Boughton, a country doctor on horseback; Ainge Devyr, a revolutionary Irishman. Devyr had seen monopoly of land and industry bring misery to the slumdwellers of London, Liverpool, and Glasgow, had agitated for change, had been arrested for sedition, and fled to America. 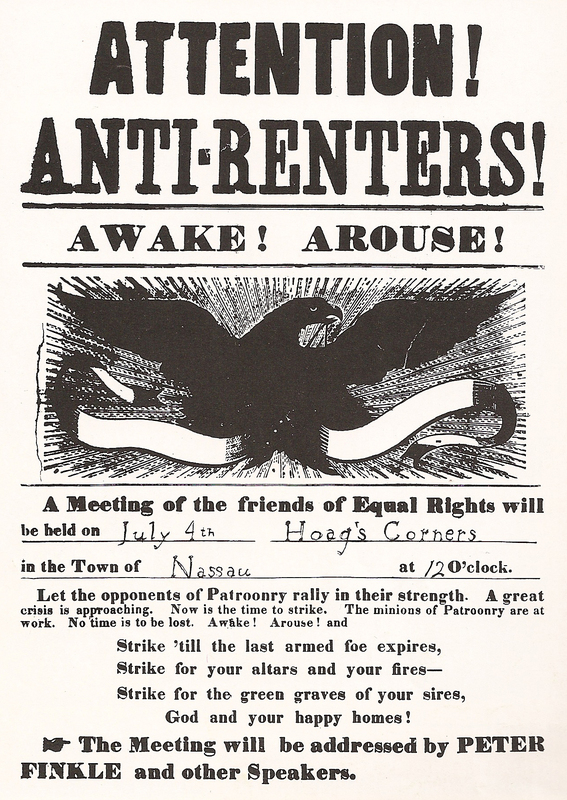 He was invited to address a Fourth of July rally of farmers in Rensselaerville, where he warned his listeners: “If you permit unprincipled and ambitious men to monopolise the soil, they will become masters of the country in the certain order of cause and effect…"
Thousands of farmers in Rensselaer country were organised into Anti-Rent associations to prevent the landlords from evicting. They agreed on calico Indian costumes, symbol of the Boston Tea Party and recalling original ownership of the soil. The tin horn represented an Indian call to arms. Soon 10,000 men were trained and ready. Sheriffs and deputy sheriffs trying to serve writs on farmers were surrounded by calico-clad riders who had been summoned by tin horns sounding in the countryside—then tarred and feathered. One of the most hated elements of the lease gave the landlord the right to the timber on all the farms. A man sent onto a tenant’s land to gather wood for the landlord was killed. Tension rose. A farm boy was killed mysteriously, no one knew by whom, but Dr. Boughton was jailed. The governor ordered artillerymen into action, and a company of cavalry came up from New York City. Petitions for an anti-rent bill, signed by 25,000 tenants, were put before the legislature in 1845. The bill was defeated. A kind of guerrilla war resumed in the country, between bands of “Indians” and sheriffs’ posses. Boughton was kept in jail seven months, four and a half months of that in heavy irons, before being released on bail. Fourth of July meetings in 1845 attended by thousands of farmers pledged continued resistance. When a deputy sheriff tried to sell the livestock of a farmer named Moses Earle, who owed $60 rent on 160 stony acres, there was a fight, and the deputy was killed. Similar attempts to sell livestock for rent payments were thwarted, again and again. The governor sent three hundred troops in, declaring a state of rebellion existed, and soon almost a hundred Anti-Renters were in jail. Smith Boughton was brought to trial. He was charged with taking papers from a sheriff hut declared by the judge to have in fact committed “high treason, rebellion against your government, and armed insurrection” and sentenced to life imprisonment. Those “Indians” found to be armed and disguised at Moses Earle’s farm, where the deputy had been killed, were declared by the judge to be guilty of murder, and the jury was so instructed. All were found guilty, and the judge sentenced four to life imprisonment and two to be hanged. Two of the leaders were told to write letters urging the Anti- Renters to disband, as their only chance to escape heavy sentences. They wrote the letters. The power of the law thus crushed the Anti-Rent Movement. It was intended to make clear that farmers could not win by fighting—that they most confine their efforts to voting, to acceptable methods of reform. In 1845, the Anti-Renters elected fourteen members to the state legislature. Governor Silas Wright now commuted to life imprisonment the two death sentences and asked the legislature to give relief to the tenants, to end the feudal system in the Hudson Valley. Proposals to break up the huge estates on the death of the owners were defeated, but the legislature voted to make illegal the selling of tenant property for non-payment of rent. A constitutional convention that year outlawed new feudal leases. glad to see this up here.